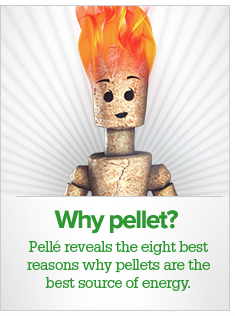 Wood pellets have all the properties that you would expect from a modern fuel. They are economical, convenient, environmentally friendly and crisis-proof. The regionally produced wood pellets made from sawdust provide independence from expensive fossil fuels and protect the environment as their combustion is CO2-neutral*. A comparison of the price changes in gas, oil and pellets over the last 12 years makes it very clear: the pellet price is reliably low and stable. Pellets are supplied by tanker, blown cleanly and odour-free into the storage room. The fully automated pellet delivery system takes the pellets from storage room to the boiler, where they are automatically ignited and combusted. Our tip: Pellets with the ENplus seal guarantee the best quality. Wood is a renewable raw material. Every year the European wood reserves grow by around 770 million m3, of which only two-thirds are currently felled. This makes pellet supply stable and assured for the long term, even in the face of increasing demand. Oil and gas reserves are limited and are often located in politically risk-prone countries. In contrast, pellets are manufactured regionally from domestic timber. This creates independence, safeguards jobs on site and generates added value in the country concerned.